With a challenging course designed by Rees Jones in an exquisite and serene bluegrass resort setting, Griffin Gate Golf Club is proud to be one of the top clubs in the greater Lexington area. 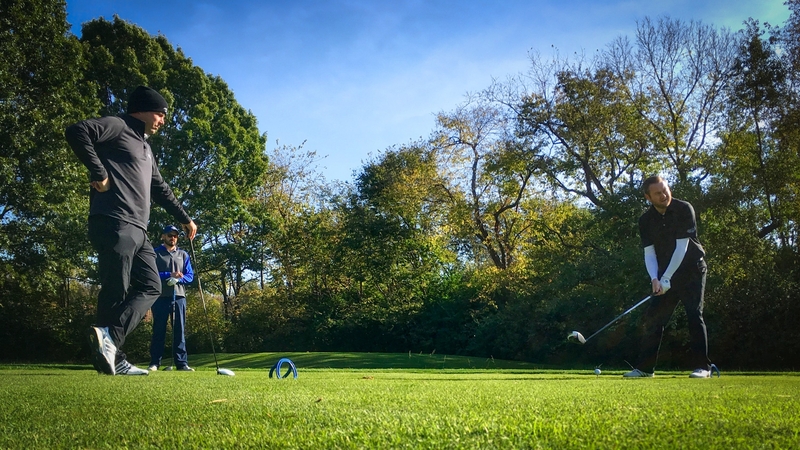 Our seasoned team of golf professionals lead by Colin Gooch, PGA Director of Golf offers an array of instruction where players of all ages can to play golf or improve their game. Classes, clinics, and private instruction are all available throughout the year. For more information on improving your game, please contact the golf shop at 859-288-6193. This one-on-one scenario with Colin Gooch, PGA Director of Golf provides the opportunity to concentrate on improving a specific area of your game with intense attention. Available for all ages and skill of play including junior private instruction specific for golfers ages 15 and under. Club Members receive a 25% discount on instruction and Player's Card holders receive a 15% discount. Griffin Gate offers Half-Day and Full-Day junior golf camps during the summer, open to players ages 5 - 15. These camps are the perfect opportunity for young players to learn the basics of golf and get familiar on the course, in a fun group setting atmosphere. Half-Day Camp runs from 9 AM - 11:30 AM and is priced at $200 per week for Members and $225 for Non-Members. Full-Day Camp runs from 9 AM - 2 PM and is priced at $250 per week for Members and $275 for Non-Members. Full-Day Campers must bring their own lunch, excluding Friday when we will provide pizza. Attention Lexington area parents, Griffin Gate Golf Club will again be offering special junior clinics during the months of July and August. Morning clinics will be offered Monday - Friday and last two hours. Clinics will be open to ages 7-15 and grouped accordingly. During our intensive clinics designed specifically for junior golfers, children will learn fundamentals of the swing, putting, chipping, pitching and bunker play as well as the basic rules and etiquette of the great game of golf. To conclude the week, participants will take place in a “Skills Challenge” covering all skills learned throughout the clinic. All clinics boast a 5:1 student to teacher ratio with a maximum of 10 students per clinic to ensure a quality experience for all participants. Request to join the GGGC Newsletter and be sure to follow our social channels for up to date information on our summer Junior Clinics. Designed to increase the basic principles of teamwork, our Corporate Clinics offer the ultimate golf learning experience designed to both improve your game and your ability to function as a team. From group clinics to multi day programs, we're happy to work with you on a fun and effective plan for your team. For more information on improving your game, please contact Colin Gooch, PGA Director of Golf at 859-288-6183. Marriott Golf is proud to offer 50 courses in 15 destinations around the world with special discounts for families, military, and Marriott Bonvoy® members. Active, reserve and retired military are offered an early twilight rate during peak season of $36 (Monday through Thursday) and $46 (Friday through Sunday and Holidays) at 1:00pm versus the standard 3:00pm. Reservations can be made up to 3 days in advance and a valid military ID card must be presented at check in. This special applies to three guests in addition to the veteran. Junior golfers ages 15 and under play one complimentary round for each full-paying adult accompanying them, after 3:00 pm, throughout the year. Proper dress code is required for adults and juniors. Reservations can be made up to 7 days in advance. Similar to our military program, the College Links program offers college golfers with student ID an early twilight rate of $36 (Monday through Thursday) and $46 (Friday through Sunday and Holidays) at 1:00pm versus our standard 3:00pm (offering a peak season discount). Reservations can be made up to 3 days in advance and a valid student ID card must be presented at check-in. This special applies to three guests in addition to the student.